The title alone should send a few shivers through the RIM camp and rightfully so. BBM is the glue of the BlackBerry experience today and iMessage, just announced by Apple at WWDC today, threatens to rip that badge of honor right off – literally and figuratively. 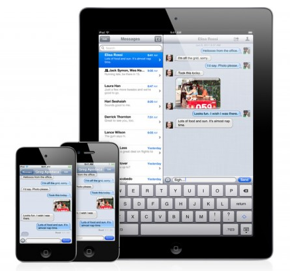 So what is iMessage from Apple? It’s a new push notification messaging service, which is clearly a full-on competitor to our dear RIM (”Canadians I’m talking to you”). The service will work on any iOS device. You read that right – any Apple device – and lets you send text messages, photos, videos, and contacts to anyone else with one too. It also supports group chats and integrates with the new Notification Center in iOS5 (more on this in another blog soon). To make matters even more scary for RIM loyalists, it works over WiFi or 3G. I know what you are thinking, and its that, RIM has delivery notifications. Well, you wouldn’t expect Apple to copy RIM’s secret sauce and not include deliver notifications, so, as you would expect, iMessage will also have delivery and read confirmations. So what does this mean for RIM? Well in short, it makes a few of the decisions that have RIM have been reportedly mulling over that much more critical. In one camp, one could argue that RIM must keep BBM as its exclusive weapon to keep the BlackBerry folks locked in. But, let’s not forget that there are tons of apps on the market aimed at bridging the cross platform messaging gap and now that Apple has entered the game, with their eco-system of iPhones, Macs and iPads they can easily and quickly reach some critical mass and replicate what RIM has built over the last decade. On the other side of the camp, one could argue that the solution is for RIM to build a BlackBerry app for iPhone. I say, do it. For RIM, cross browser apps are going to gain more traction as time progresses and the need has already been validated. After all, as of today it may be too late anyways. Apple has now entered the space with a much larger eco-system (i.e. 200 million devices), albeit a new messaging app and owning this space for RIM may be just what they need to retain some mindshare, while they get their product road map sorted out and release some devices on the QNX platform. So, what do you think? Keep BBM exclusive to BlackBerry users or open it up for one and all?